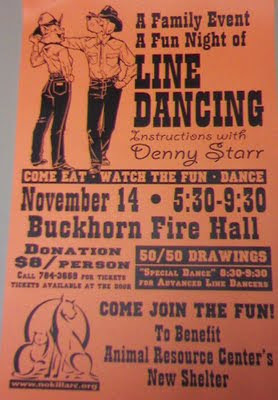 Come join us for a family fun night of LINE DANCING at the Buckhorn Fire Hall on November 14, from 5:30 - 9:30. Come eat, dance, or simply watch the fun. Don't know how to line dance, but want to learn? Get instructions with Denny Starr. "Special Dance" from 8:30 - 9:30 for advanced line dancers! Come join the fun. Tickets are $8/person, and are available at the door, or call 784-3669 for advance purchase. Proceeds benefit the Animal Resource Center's new shelter. See all of our upcoming events on our Calendar of Events.